No bake vanilla bean cheesecake, this recipe really came about because I wanted to make a snickerdoodle crust, or try a few snickerdoodle crusts really. A layer of delicious baked cookie as a crust? Heck yes. Or delicious non-graham cracker crumbs made into a crumb crust – umm also yes. Graham cracker crusts have had the spotlight for way too long – time for everyone to branch out. Anyway – my crust cravings needed something to accompany them so cheesecake was the obvious answer. And well, I’m a sucker for traditional (some say plain) flavors. But this cheesecake is deliciously creamy, comes together so quickly (aside from the chilling), and the vanilla flavor is a perfect companion to a slightly cinnamon-y crust. On another topic – why does crust-less cheesecake even exist? I could not imagine a more disappointing slice of cheesecake than one that doesn’t even have a crust! That’s all I could think about while I devoured my individual mini cheesecake cup with it’s delicious crumb crust made from the extra in this recipe – but more on that later. To get started I scooped our snickerdoodle cookie dough using a #70 scoop, looking back I could definitely have used a larger scoop but I just went with the first one I grabbed. Using our pre-made dough made this super simple & quick – but you can basically sub in any cookie dough, snickerdoodle or otherwise. Then I rolled them all in a mixture of cinnamon and sugar. Now you’ll have to make a choice which crust road you want to go down – baked cookie? Or crumb crust? Or even a third road I didn’t go down – if you’re using our egg-free safe to eat raw dough you could even do a layer of raw cookie dough as the crust! Did you make a choice? Or want to try both like I did? That’s okay too. To make the whole cookie crust I used about 4 cookie dough balls pressed into the bottom of a lightly greased cheesecake pan and baked for about 9 minutes. After baking, I pressed the cookie down slightly while it was still warm just to flatten it out. I let it cool a bit then stuck it in the fridge to chill before adding the cream cheese mixture. You’ll want it room temp or colder to prevent the cream cheese mixture from melting. For the crumb crust, I flattened the dough balls using the bottom of a small canning jar. It worked perfectly and I also used it as a size gauge to make them all the same thickness. I baked them for 10 minutes and let them cool on the cookie sheet to ensure they were well crisped. I used 12 cookies to make 1.5 cups of crumbs. A mini food processor works perfectly to blitz the crumbs and that’s my favorite way to do it; it’s cute and tiny and works these jobs so quickly! Plus, a mini processor is so much easier to clean than my massive & heavy 14-cup food processor. Once you have a some nice evenly ground crumbs you just need to mix in some melted butter and a pinch of salt (which is optional). Instead of adding salt you could even just use salted butter for that extra bit of saltiness. Or I mean, if you don’t have unsalted butter, salted butter will totally work in this case. However, I’ll warn you against subbing in salted butter in ALL circumstances because once as a young naïve child I made an apple strudel brushing each layer of dough in salted butter and that dang thing was basically inedible. My poor dad probably ate it anyway, ha. Once the butter is distributed, simply press an even layer of crumbs into your pans. I used a tart dough tamper but a flat bottomed glass or measuring cup will work. Okay, you’re almost there! Crust(s) are done and ready to be filled – time to make that filling! Before you start on the filling – make sure your cream cheese is at room temp. Colder cream cheese will be difficult to fully incorporate and you’ll be left with tiny chunks of cream cheese throughout your cheesecake. 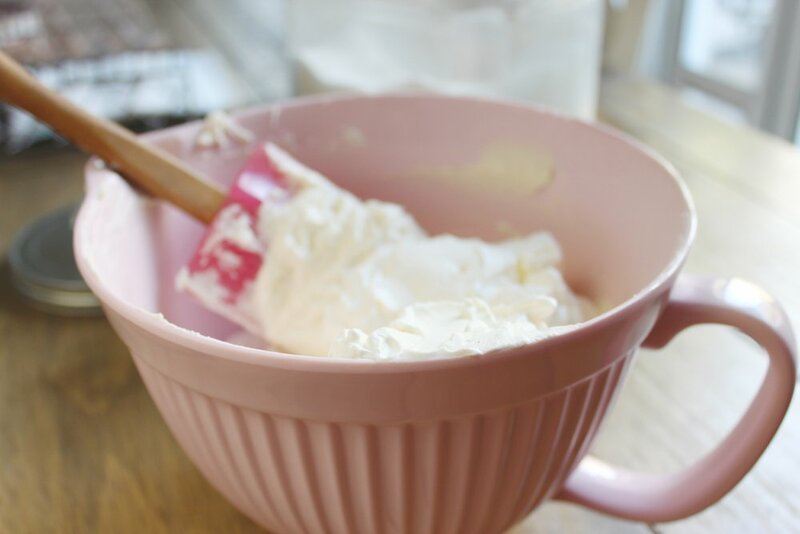 Second, put the bowl you’ll use to whip the cream as well as the wire whip in fridge or freezer for a quick chill. I folded in about 1/3 of the whipped cream into the cream cheese mixture just to lighten it up before adding the rest. Once you’ve added the remaining cream fold just until there aren’t any pockets of cream remaining. And now your filling is ready! Spoon the filling into your prepared crusts and chill them for several hours. I filled my pans to the top just so I could get a super smooth top using an offset spatula to scrape across the top edge of the pan. To speed up the process a bit I did place them in the freezer briefly (less than an hour) to get the filling set without actually freezing it. Plus, they were super easy to unmold straight out of the freezer! I happened to not have any berries or anything to top these with but I typically love a little fruit with cheesecake – especially strawberries. Feel free to be creative and add whatever topping you can think of, or just whatever you happen to have on hand! A little salted caramel sauce would be awesome too! Hope you love the recipe! Let me know your favorite cheesecake topping in the comments! balls and roll into the combined cinnamon/sugar. thickness (about 1/4”) and bake for 9 minutes. remove from oven and let cool. is distributed and press into cheesecake pans. & beat for 2-3 minutes until well incorporated & smooth with no remainining cream cheese chunks. mixture until incorporated. fold in remaining 2/3 whipped cream. fill prepared cheesecake pans. chill at least 6 hours or overnight. unmold & serve! can be topped to your heart’s desire with fresh fruit, caramel sauce etc.